Greg Natter passed away peacefully December 3, 2018. Greg was born on April 28, 1968 to Verlin “Bud” and Bernadine Natter. 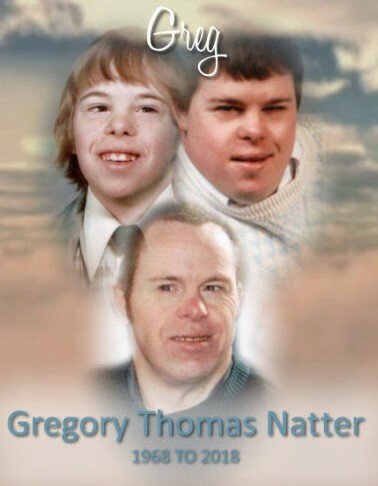 Greg was preceded in death by his parents and sister-in-law, Linda Natter. Greg was an avid sports fan; he loved cheering on his favorite sports teams. He participated in Special Olympics. Greg brought life to many parties with his dancing. Greg loved holidays; he enjoyed the boat parade on the Fourth of July. On Christmas Greg thoroughly enjoyed giving and getting gifts.Greg was a long time employee of Lott Industries having a very strong work ethic. Greg is survived by his brothers John (Shelia) Natter and Jerry (Kim) Natter, sisters Ann (Paul) Kirkum, Carol (Ray) Wilson, and Mary (Tony) Echler. Nieces and nephews Rita, Emily and Patrick Natter, Chris (Stephanie) Kirkum, Elizabeth and Sarah Wilson, Amanda, Nicole and Addison Natter, and Stephanie, Katelynn and Logan Echler. Visitation will be held Wednesday, December 5 2018 from 5:00pm to 9:00pm with a Rosary Service at 7:30pm at Reeb Funeral Home, Sylvania. Prayers will be held at Reeb Funeral Home at 10:00am on Thursday, December 6 2018 followed by Funeral Mass at Holy Trinity Catholic Church (US 20, Swanton, Ohio) at 11:00am. Interment will follow at St. Elizabeth Cemetery. Memorial contributions can be made to Camp Courageous or Holy Trinity Catholic Church.